There are countless thousands of online merchants these days, and they sell every imaginable product, item, thingamajig, and plant. Of course, you can buy strawberry plants online these days too. In fact, there are a host of sellers of strawberry plants just waiting for you to hit their homepage. Well, do you want to know where to buy strawberry plants? Look no further. You can use this page to purchase strawberry plants according to the specific variety or varieties you want at the best possible price. The work has been done for you! Just click the name of the strawberry variety in the table below for which you are looking, and you will jump to a table listing all the known merchants who offer that variety of strawberry plants for sale. To make the most of this directory, you need to know which type of strawberry you need and which cultivar you want. To understand the differences, and to get an idea of varieties that will work for you and your circumstances, first visit the Strawberry Varieties page. If you don’t care much about learning the specifics, you can go with one or two of the Recommended Strawberry Varieties for Your Location. Once you know what you are looking for, come back here and find the best price for strawberry plants by comparing prices for each and every variety you want. Once you find a nursery, farm, or supplier with whom you are comfortable doing business, you can find all the varieties they offer by looking them up in the Strawberry Plants for Sale directory (they are in alphabetical order). This table includes all the known strawberry plant varieties that are available for purchase online. Our aim is to make this table exhaustive, so if you are aware of an error or of other sellers of strawberry plants or of other varieties, please let us know! 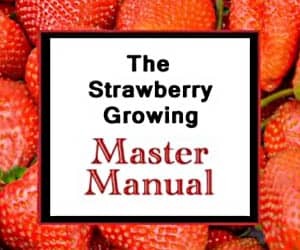 And, don’t forget, all the information you need to be successful is available here: Growing Strawberries. Best place to start your search for plants is Amazon.com. They have many varieties for sale. If you don’t find what you’re looking for from Amazon.com, then take a look at the list below. Also, see the profile page for much more information on the strawberry variety ‘Benicia‘. 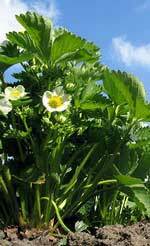 Also, see the profile page for much more information on the strawberry variety ‘Blakemore‘. Also, see the profile page for much more information on the strawberry variety ‘Cardinal‘. Also, see the profile page for much more information on the strawberry variety ‘Chandler‘. Henry Field’s Seed & Nursery Co.
* the specific branded ‘Everbearing’ strawberry is no longer available. Everbearing is a type of strawberry as well, and many varieties are of that type and still available. Gurney’s Seed & Nursery Co.
Also, see the profile page for much more information on the strawberry variety ‘Mojave‘. Also, see the profile page for much more information on the strawberry variety ‘Ozark Beauty‘. Also, see the profile page for much more information on the strawberry hybrid Pineberry. Also, see the profile page for much more information on the Purple Strawberries. Also, see the profile page for much more information on the strawberry variety ‘Sweet Charlie‘. Also, see the profile page for Fragaria glauca, the Mountain Strawberry, a subspecies of Fragaria virginiana. TN Nursery, Wholesale Nursery Co.
With the resources on StrawberryPlants.org, you need not worry about finding success, even if you have never grown strawberries before. Use this site to research any question you have (try the search option at the top right of this page), and feel free to contact us or leave a comment. The hardest part is finding a supplier of strawberry plants, and we have helped with that! There are no excuses now that you know where to buy strawberry plants. Does Earliglow Junebearing strawberries grow well in the Portland, OR climate in a regular home garden? If not, what are a few varieties you might recommend for this area that are delicious and easy to grow (and if possible can come back next year in this area)? Thank you and blessings! You can see the official recommended varieties for where you are here. Although Earliglow isn’t on the list, it actually should perform reasonably well there. Good luck! Thanks for the compliment! I’m glad we could help! I want to attempt to grow strawberries in the Caribbean. Can you please suggest the best varieties for this region and make any suggestions that you think will help. Unfortunately, the Caribbean isn’t the best place to try and grow strawberries. It is generally too hot. You might want to give Chandler a try, however, if you do try to grow them. Good luck! Where can I find Delmarvel Strawberries? I live in Southeastern Pa and saw at both Penn St and Rutgers recommend these varieties for this area………. Delmarvel strawberries are a good choice, but they have been out-performed by more recently released varieties. You can probably find them at local nurseries in your area, but they aren’t available for ordering online (as far as I am aware). You can find a host of others here. Good luck! To Whom It May Concern, I have no idea how to buy strawberries. I don’t know what kind I should get or what they should cost. Please educate me-when you have a chance. I am sure you are very busy, I am just too ignorant about them. Am sorry about this. Also, in cases where people may have verticillium, is there some kind of powder or spray to combat that sort of thing? What can anyone use? Thank you already. To buy strawberries, just click the links on this page for the variety you wish to grow. Use this page to find the right varieties for your location. For strawberry diseases, and treatments, peruse the Library for applicable information. Good luck! Been looking through here at the vendors. Most don’t specify the age of these plants. I am interested in fall planting and spring harvest ,then plow them and start over again in the fall with new plants. Am not interested in establishing a plant for 18 months . Also price for these plants is a big factor . If when its done it cost me as much as it would to buy the fruit retail + plus the work I am not interested . The prices look go for the most part with these vendors . Can anybody recommend one that sells mature plants at a reasonable price ? For what you are wanting to do, check the vendors that offer Fall Strawberry Plants for sale. Good luck! I am hoping to find strawberry plugs for May, 2014. Anyone know a Canadian Supplier of strawberry plugs? or.. A company who can ship plugs into Canada? You should find several here who can ship to you in Canada: Strawberry Suppliers. Good luck! I am looking for Sweet Ann organic strawberries to grow in central texas. Can you tell me if they are available and at what price Ican buy them if I buy 100. I am not aware of anyone selling Sweet Ann strawberries in your area. If you discover them for sale, please do let me know, and I will include them in our directory. Good luck! Hello I live in Michigan. What variety of plants would you recommend I like the day neutrals. The recommeded varieties are here for Michigan. Tribute and Tristar are the day-neutrals. Good luck! Do you have a list of the best plants for each state or zone? I live in Orlando Fl. and want to add strawberries to my garden. Yes, indeed! It is here: Recommended Strawberry Varieties by State. I need some early, middle, and late plants for Missouri. Could you recomend the best sort? Sweetest? biggest? biggest yielding? Thank You. I’d recommend reviewing the recommended varieties for Missouri. Good luck! I live in the southern part of Alabama. Can you recommend an everbearing or day-neutral strawberry that will produce fruit in the fall as well as spring for my area? Thanks. You could try Ozark Beauty (everbearing) or Tribute/Tristar (day-neutral). For other recommendations, see the listing for Alabama here: Recommended Varieties by State. Good luck! I live in Parkersburg, WV. I am looking for an everbearing strawberry that will grow well here. Several years ago I found a local supplier that sold bare root plants that performed wonderfully and were very prolific. I have been unable to locate them again. What do you suggest? I would recommend Ozark Beauty. It is a tried and true everbearing variety and should should do well where you live. You can find suppliers here: Ozark Beauty. Good luck! can you tell me how big an area I will need for 1000 strawberry plants? Could you suggest a strawberry plant variety that would do well in Connecticut? The following two varieties should do well for you in Connecticut: Earliglow, Jewel. Good luck! This is such an informative site! Kudos for helping so many people! I am wondering which strawberry variety is the absolute sweetest with the best flavor. I am not too concerned with having enormous berries or a high yeild, I would rather have fewer berries that are decadent. Also, if it halps, I live in the Portland, OR area. Thank you! If taste and aroma are your primary concerns, go with an Alpine variety. This one is excellent. Good luck! Earliglow is a good variety, but these may do better in Kentucky: Camarosa, Chandler, Jewel, Northeaster, Sweet Charlie. Good luck! We are planning to plant strawberry plants in South Korea this early spring, and would like to harvest the fruits this late spring and early summer. Whis varieties are suitable, and where can we buy young strawberry plants? Unfortunately, I am not familiar with the South Korean climate. However, I can tell you that you will likely have much happier plants and much bigger long-term yields from your strawberry plants if you modify your plans slightly. Planting strawberry plants in the spring and hoping to harvest just a few months later usually is not a very successful approach. You might get a small harvest, but the plants will do much better in the long run if you snip or pinch off the blooms throughout the first growing season to allow the plants to establish themselves and develop hearty and powerful root systems. See the Growing Strawberries reference page for more details. As for buying the plants, I don’t know of any Korean suppliers at present. You could try contacting some of the suppliers listed in the directories on this site to see if they are able to ship internationally. Good luck! I live in near Philadelphia, and am wondering if I can plant several kinds of strawberry plants together in one conatiner to expand the growing season, with some ripening at various points in the season? Thank you! As long as your container is large enough to accommodate multiple plants, you can most definitely extend the growing season and harvest. If you look at the chart near the top of the Strawberry Varieties reference page, you can get approximate ripening times. If you plant early season, mid-season, and late season varieties, you’ll accomplish your goal, if all goes and grows well. Good luck! I live in new york and I would like to grow strawberries hydroponically. Which variety would you recommend for hydroponics? You need a day-neutral variety for best results using hydroponics (see the Strawberry Varieties page for details on day-neutrals). The varieties that most hydroponic growers do the best with are Tribute and Tristar. Good afternoon, tell me what kind of strawberries to choose to grow year-round in greenhouses for commercial sale. Also interested in the variety to be grown in hydroponic setup. Usually, day-neutral strawberries do best for year-round and hydroponic growing. For more information on day-neutrals, see the Strawberry Varieties reference page. Two of the best varieties are Tribute and Tristar. Good luck! You are definitely pushing it as far as planting a strawberry bed that will successfully make it through the winter since you live in a northern climate. But, it can’t hurt to try! See the Fall Strawberry Plants page for more information. You may want to establish a new bed as old plants can harbor diseases that can be passed easily to new plantings. And, to keep your beds vital on a sustainable and long-term basis, see the system on the Transplanting Strawberries page. Can you recommend a source for the strawberry variety ‘Charlotte’ in the US? I am unaware at present of any suppliers of the ‘Charlotte’ variety in the U.S.A. Sorry! If you discover one, please do let me know. Am trying to find a source for strawberry plants this fall to plant in the garden, most only do spring planting. For retailers who offer fall shipments, see here: Fall Strawberry Plants.